^ a b editor; Ramchandani (2000). Dale Hoiberg, ed. A to C (Abd Allah ibn al-Abbas to Cypress). New Delhi: Encyclopædia Britannica (India). p. 2. ISBN 978-0-85229-760-5. ^ Sen, Amartya (2003). "India and the Bomb". In M. V. Ramana; C. Rammanohar Reddy. Prisoners of the Nuclear Dream. Sangam Books. pp. 167–188. ISBN 978-81-250-2477-4. ^ "Dr.Kalam's Page". 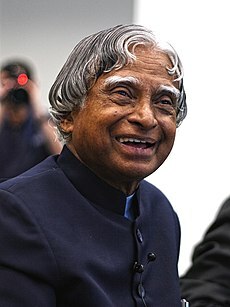 abdulKalam.com. Archived from the original on April 24, 2012. Retrieved 1 March 2012. ^ "APJ Abdul Kalam is honorary professor in top Chinese University". GKToday. 2014-11-07. Retrieved 2019-03-27. ^ "印度前总统卡拉姆博士接受北京大学名誉教授称号，入选"大学堂"顶尖学者讲学计划". University of Beijing. 2014-11-14. Retrieved 2019-03-27. 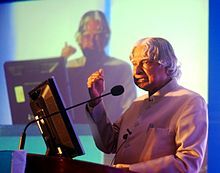 ^ "AMU to honour Kalam with doctorate". Articles.economictimes.indiatimes.com. 2008-06-05. Retrieved 2017-04-17.